Brightboy is made of aluminum oxide with a resilient rubber bond, making it long-lasting. Its uniform cutting action makes it ideal for deburring and scratch removal on nonferrous metals. Also for light grinding of carbon steel. Permits cushioned action on flat and contoured surfaces. The texture and cutting action are always uniform. 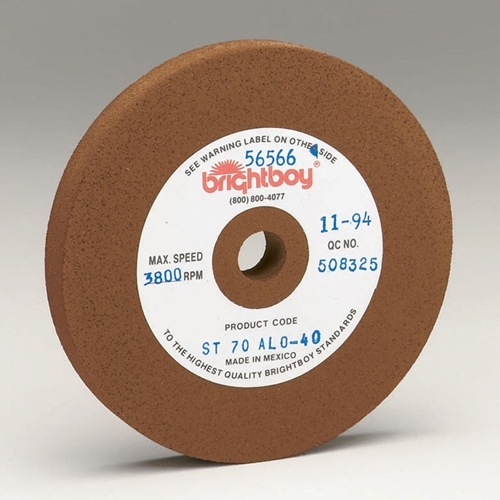 Brightboy requires no additives such as cutting compounds. Not for use on tapered spindles. These large wheels are for use on your polishing/buffing motor. Small discs are available for use on your flex shaft handpiece, see "Related Products" below.